I remember sitting there, watching everyone have those drinks and I was stuck with ICE TEA cause I was sitting for my certification exam right after that and wishing I could have had a REAL Drink." "Remember the bird who joined us and wouldn't shut up?" "Remember the rain deluge and how we had to move under the porch and everyone was so enthralled by all the info we were getting that NOT One Person left?" 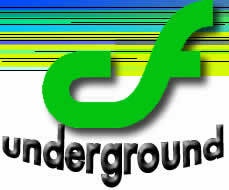 "CF_Underground. Definitely something not to be missed! I'm going again, all signed up? What about everyone else?" "Don't forget the pre-event warm up in the pool bar on Sunday CF_Underground. I remember Michael D in sun glasses and drink in hand, making jokes over the CF-Jeopardy game music. And Erika shouting the players on. Pix here." "I was so jet lagged for this event after having tried very hard to stay awake for fusebox, that thing i remember most was the great frozen drink I had." "There was some sort of jeopardy game, I remember that too." "Any plans for another CF_Underground? IMO it was one of the best parts of DevCon last year." "While I'm here in Orlando at DisneyWorld to go to DevCon, I'm also attending a few "unofficial" events. I just left CF Underground, hosted by Michael Smith of Teratech! It was great to meet a lot of folks in person that I have only talked with in the ether of cyberspace. Write your project out in plain English - i.e. "Query the location database with the zipcode input from the user, then present all locations which have the requested zipcode." This kind of plain-english description can the easily be used to comment your code, and makes actually creating the code much easier. Naming conventions - The specifics of the convention you use aren't as important as just making one and ALWAYS USING IT. If you work with others, publish it where all of your team can get to it, and make sure everyone follows it. CF includes compile a class file for each, so be mindful of how many you use in a page, as each one will generate a class file, UNLESS it has no CFML in it, in which case no class file is compiled. Comment your code - it's essential for when you or someone else has to look at your code and know what it does. The important take away - Comment your commented out code - why you commented it out, why you left it in, what it did, etc.. We usually leave commented code in for some reason, but we often forget why. Commenting your commented-out code will remind you why you left it there.